Brandy is made all over the world, but only brandy made in the Cognac region of France, and under the strictest guidelines, can be called “Cognac.” The Cognac region stretches over two regions in western France, Charente-Maritime (bordering the Atlantic Ocean) and Charente (a little further inland). There are six crus (or growth areas) designated for producing Cognac. Listed in descending order of ageing potential and quality, they are as follows: Grand Champagne, Petite Champagne, Borderies, Fins Bois, Bons Bois, and Bois Ordinaires. Each region is a different AOC that produces Cognac of varying characteristics and ageing potentials. The term “Fine Champagne” is an AOC that refers to a Cognac composed of Grande and Petite Champagne eaux-de-vie, with at least 50% Grande Champagne. Even within the defined region, if a Cognac is produced that fails to meet any of the strict criteria set down by the BNIC—Bureau National Interprofessionel du Cognac—it may not be called Cognac. For example, according to regulations the Cognac must be aged for at least 30 months in French oak coming primarily from the Limousin and Tronçais forrests in central France. 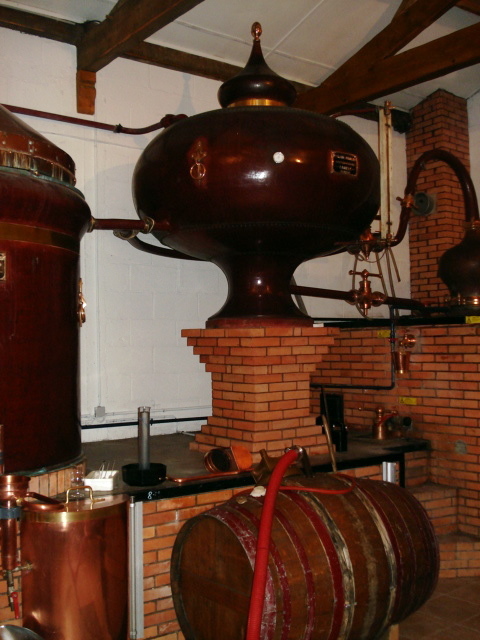 It must be obtained through double distillation in traditional copper Charentais stills. The producers may only distil between November 1st and March 31st following the harvest. And of course the wine used must come from specific white grape varieties. Ugni Blanc is the principal varietal in modern Cognac. Prior to the Phylloxera crisis of the 1870s that affected the whole of Europe, Folle Blanche was the dominant variety for Cognac. After the crisis, the vineyards of the Cognac region were replanted with Ugni Blanc mainly for its high acidity levels, discreet aromas, and resistance to infection. To this day Ugni Blanc remains the dominant variety as it is usually 95% of the blend, the rest made up with Folle Blanche and Colombard. Despite the fact that Folle Blanche is more temperate and difficult to maintain some producers are aspiring to replant their vineyards with majority Folle Blanche and return to the older style of Cognac. The process of making Cognac starts out with the pressing of the white grapes in a pneumatic press to receive grape juice followed by a 10 day fermentation period. The resulting white wine is highly acidic and very fruity with low alcohol (8-10º) content. This is an ideal canvas for creating a fine Cognac. The goal of distillation is to select and concentrate the aroma and bouquet contained in the wine. Distillation is done by heating the wine, a process of delicately separating alcohol and other volatile components from the organic, non-volatile components of the wine. Distillation of Cognac can only be done in an “alambic charentais”, the pot still in use in this region for the past 400 years. It is made of copper, and is mainly composed of a boiler, an onion-shaped head, a swan’s neck, and a condensing serpentine plunged in a water tank. Copper is an excellent conductor of heat, and its chemical properties allow it to fix and eliminate undesired fatty acids that otherwise would spoil the taste. 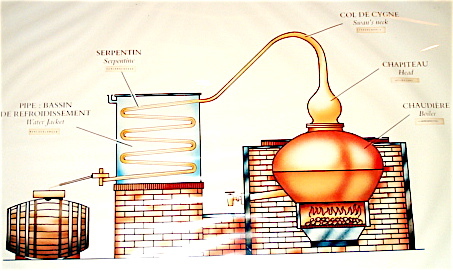 During the first distillation the white wine is boiled and the alcohol vapors are released. As they pass through the serpentine they transform into a milky liquid called “brouillis”. The point of this first distillation is to cut off the “head” and “tail” which are the most and the least volatile components. In the second distillation, otherwise called “la bonne chauffe” the brouillis is again boiled to cut off the “head” and “tail” to produce the “heart” which is otherwise the crystal clear liquid eau-de-vie. This is now poured into oak barrels and kept for ageing. The ageing process is an essential step that allows a constant exchange between the eau-de-vie, wood and air. This is necessary for the slow and natural development of aromas from the 3 big families: fruit, flowers and spices, among others. 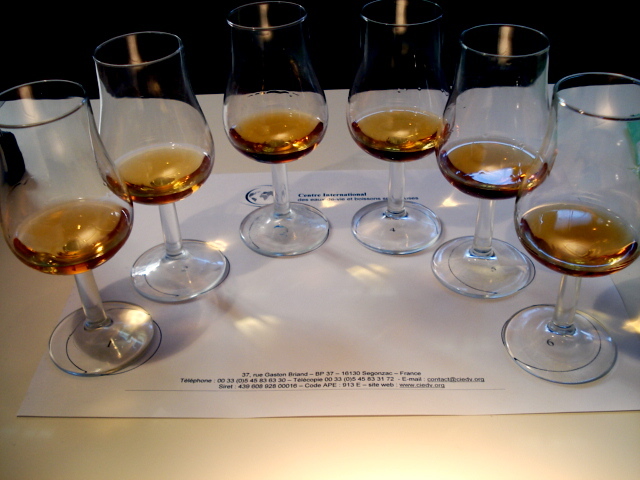 The longer the cognac ages the more aromas and complexity it develops. The liquid will pass through 3 different oak barrels to achieve different characteristics in the final product. For the first 6-12 months it will start in a new oak barrel where it gains a lot of its spicy aromas. Next it will go into an older seasoned cask that will give the Cognac more texture, suppleness and complex aromas. Finally it is aged in an old 10-20 year barrel that will refine the final product. The older the Cognac, the more money you will spend. However it does not mean it is best. As with wine, tasting Cognac is a subjective experience and someone can easily prefer a VSOP to an XO depending on their personal palate. Another issue with tasting wine is how to serve it. While they each have their own stories and claims to fame, these Cognac houses share, in their values, tradition and the pioneering spirit that put them on the map.